What is a ubiquitin protein ligase? Ubiquitin is a small protein consisting of only 76 amino acids. It is attached to other proteins by an enzyme called a protein ubiquitin ligase in a process known as ubiquitination. Ubiquitin acts as a marker that targets proteins for proteolysis (meaning cleavage of proteins by proteases, enzymes that degrade protein molecules). Ubiquitin is appropriately named since it is ubiquitious and present in essentially all cell types. Ubiquitin is activated by an E1 ubiquitin-activating enzyme. 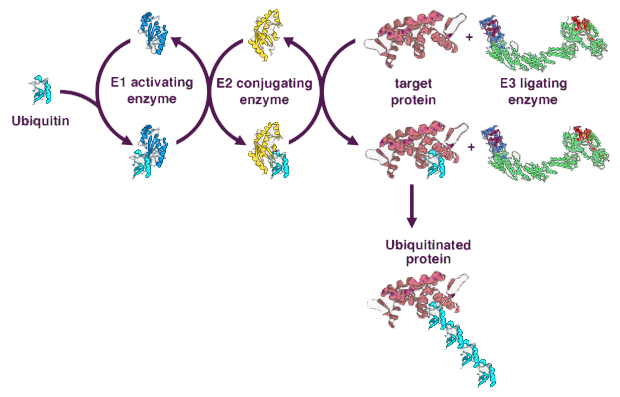 Activated ubiquitin is transferred from E1 to the ubiquitin-conjugating enzyme E2. The E3 ubiquitin-ligating enzyme interacts with both the E2 enzyme and the substrate (meaning the molecule upon which an enzyme acts), and transfers ubiquitin to the substrate protein. Frequently, the process is repeated to form a polyubiquitin chain. The 2004 Nobel Prize in Chemistry was awarded to Aaron Ciechanover and Avram Hershko (Technion Israel Institute of Technology, Haifa, Israel), and Irwin Rose (University of California, Irvine, US) for the discovery of ubiuitin-mediated protein degredation. The British Columbia Cancer Research Centre study, done in both mice and human tumor cells, demonstrated that HACE1 is a tumor suppressor. Researchers “knocked out” the gene in mice (meaning the gene was inactivated so that it wasn’t expressed) and found that as the mutant mice aged, they spontaneously developed a spectrum of tumors, including melanoma (the most serious form of skin cancer), hepatocellular carcinoma (primary liver cancer), spontaneous lung adenocarcinoma (lung cancer), angiosarcoma (tumors that develop from blood or lymphatic vessels), mammary carcinomas (breast cancer) and lymphomas (a family of cancers that develop from immune system cells called lymphocytes). Additionally, loss of HACE1 expression also rendered the mice susceptible to environmental and genetic second hits for the development of multiple cancers. The mutant mice were subjected to various forms of stress, including ultraviolet radiation, lung carcinogens or other genetic alterations, and the result was a dramatic increase in cancer growth. The mice developed breast, lung, and liver cancers, as well as lymphomas, melanomas and sarcomas. When HACE1 was expressed in human tumor cells, the cells lost their ability to form tumors. The tumor-suppressor function of HACE1 was shown to be dependent on its E3 ligase activity and the researchers suggest that HACE1 regulates cell cycle progression during cell stress by influencing degredation of the protein cyclin D1, which plays a key regulatory role during the G1 phase of the cell cycle. What does all this mean? A distinctive feature of cancer is the subversion of normal growth signaling pathways and cell cycle regulators are natural targets during tumor development. Overexpression or amplification of cyclin D1, an oncogene, has been identified or associated with a range of human cancers, including B mantle cell lymphoma , non-small cell lung cancers , head and neck squamous cell carcinoma , pancreatic carcinomas , bladder cancer  and breast carcinoma . If scientists can express HACE1 in human tumors or prevent HACE1 inactivation, it may be possible to improve cancer treatments. Williams et al. Chromosome t(11;14)(q13;q32) breakpoints in centrocytic lymphoma are highly localized at the bcl-1 major translocation cluster. Leukemia. 1993 Sep;7(9):1437-40. Yamanouchi et al. Expression of cyclin E and cyclin D1 in non-small cell lung cancers. Lung Cancer. 2001 Jan;31(1):3-8. Izzo et al. Dysregulated cyclin D1 early in head and neck tumorigenesis: in vivo evidence for an association with subsequent gene amplification. Oncogene. 1998;17:2113-22. Gansauge et al. Overexpression of cyclin D1 in human pancreatic carcinoma is associated with poor prognosis. Cancer Res. 1997;57:1634-7. Hall and Peters. Genetic alterations of cyclins, cyclin-dependent kinases, and cdk inhibitors in human cancer. Adv Cancer Res. 1996;68:67-108. Barnes and Gillett. Cyclin D1 in breast cancer. Breast Cancer Res Treat. 1998;52(1-3):1-15.